Since 2013, Kellie Strom has been advocating a no-fly zone through the website Syria needs a No-Fly Zone. In a recent article for the Washington Post, Nicholas Burns and David Miliband composed a four-point call to action on Syria. Point three concerned humanitarian relief for Syrians still inside the country, and the need for enforcement of UN Security Council resolutions, particularly Resolution 2139. The debate about a no-fly zone across Syria to protect civilians from the Assad government’s deadly “barrel bombs” needs to move from slogans to details. Such zones can offer real protection (as was the case with the Iraqi Kurds in the 1990s), but a decision cannot be divorced from the wider imperative for progress toward a political settlement in Syria. Unlike the 1990s no-fly zones in Bosnia Herzegovina and Iraq, a ‘deter and retaliate’ no-fly zone would not necessitate regular patrols within Syrian air space. Instead it would require issuing a clear ultimatum to the Assad regime to stop bombing, and then responding to any further regime bombing by strikes against regime air bases rather than by trying to intercept the violating aircraft. Missile strikes against regime air bases would be cheaper and safer—both for civilians on the ground and for the enforcing military’s personnel—than a patrolled no-fly zone as they wouldn’t require the destruction of Assad’s remaining air defences. In order to avoid merely displacing Assad’s bombing campaign from one part of Syria to another, the prohibition must be Syria-wide. A no-fly zone based on a deter and retaliate strategy rather than on air patrols could just as easily be imposed over all of Syria as over a limited part. Implementing a deter and retaliate strategy without sending pilots into Syrian air space requires weapons such as sea launched cruise missiles and air launched stand-off weapons, systems that are in the arsenals of the UK and France as well as the US. Any of these P3 countries have the military capacity and expertise needed to enforce an end to Assad’s bombing of civilians. 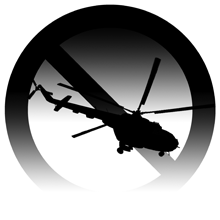 Links to some of the long history of public discussion of details on how to implement a no-fly zone are included at the end of this article. Extremism breeds from injustice—the biggest killer of civilians in Syria today is the ‘barrel bomb’. These are often old oil barrels filled with explosive and scrap metal and rolled out of government helicopters and planes miles up in the air onto hospitals, schools and homes. The UN Security Council unanimously banned them a year ago. Nothing has changed since then—nearly 2,000 children have been killed since UN Resolution 2139 was signed on February 22, 2014. The international community must follow through on its demands and stop the regime’s barrel bombs and air attacks - even if that means with a ‘no fly zone’. We have in the last week marked the anniversary of the Srebrenica massacre, a disaster in great part the result of Western governments pulling back on civilian protection in the hope of first making political progress. This terrible error allowed Serb forces to make their own preparations for an eventual political settlement by creating ‘facts on the ground’ through massacre and displacement of civilians. It was only when NATO eventually proceeded with military enforcement that conditions for a political settlement at last came about, and even then it was a settlement that rewarded ethnic cleansing and locked-in sectarian politics into the resulting political system. Western governments, led by the US, have been repeating the mistakes of the Bosnian war on an even greater scale in Syria. It is well past time for them to understand that civilian protection must come first, as a matter of humanity, and also in order to create the conditions for a lasting political settlement. See also Syrian No-Fly Zone: From Slogans to Details, a response by Frederic C Hof at The Atlantic Council website to Nicholas Burns and David Miliband’s article. Never again, and again, and again, on Bosnia and Syria. July 2015. Deter and Retaliate, on buffer zones, safe zones, and air exclusion zones. December 2014. Stop the barrel bombs: A moral and legal responsibility to use force, on the morality, legality, and practicality of intervention, and responsibility to act. April 2014. Strategic Horizons: For Syria No-Fly Zone, Less Is More, on the spectrum of no-fly zone options. January 2014. No-Fly Zone options: Reasons for favouring a limited strike option, January 2014. NFZ reading list, reporting, analysis, and advocacy, from 2011 to early 2014.